Images from the Sochi 2014 Olympic Winter Games for the Olympic Spirit Project. Russian girl wearing my Canada gear. France wins gold, silver and bronze in men’s ski cross. Canadian fan in Crosby jersey. Cutest Russian fan of Sochi 2014. Sidney Crosby at Sochi 2014. Canadian goalie at Sochi 2014. Team Canada at Sochi 2014. Canadian fans at Sochi 2014 quarterfinal game. Canadian men’s curling team vs China. Russia vs Finland quarterfinal hockey at Sochi 2014. Patrick Chan and Gilmore Junio playing street hockey at Sochi 2014. Canada vs USA street hockey at Sochi 2014. Rosa Khutor Extreme Park, Sochi 2014, Russia. Canadian fans at Austria House with the COC President. USA fans at Sochi 2014. Ladies snowboard cross medalists at Sochi 2014. Ladies snowboard cross at Sochi 2014. 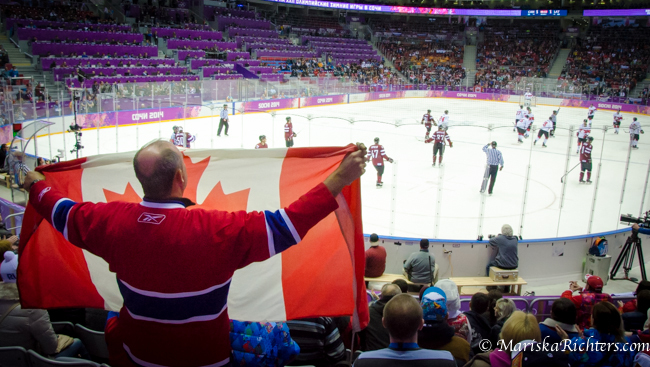 Canadian Spirit fan at Sochi 2014. Canadian fans at Sochi 2014. Canadian and USA fans at Sochi 2014. Russian fan at Sochi 2014. Russian fans at Sochi 2014. Inside the Iceberg Skating Palace at Sochi 2014. Short track speed skating at Sochi 2014. Flag inside the Iceberg Skating Palace at Sochi 2014. 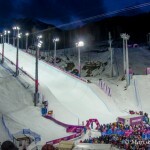 Rosa Khutor Extreme Park at Sochi 2014. Rosa Khutor Extreme Park fans at Sochi 2014. President Vladimir Putin at Canada Olympic House, Sochi 2014. The Olympic Rings at Sochi 2014. Canadian Athletes at Sochi 2014. Kickstarter SUCCESS! See you in Sochi! Canada fan gear for Sochi 2014. Canadian fan at Vancouver 2010 Olympics. Canadian fans at Vancouver 2010 Olympics.